February 24, 2014  The annual well-child visit should be about a lot more than getting shots, doctors say. New guidelines for checkups include screening tools for depression and substance abuse starting at age 11. February 25, 2013  The new guidelines for treating childhood ear infections are intended to reduce unnecessary antibiotics use. They say doctors should look at the eardrum to make sure a child really has an ear infection, instead of relying on symptoms. 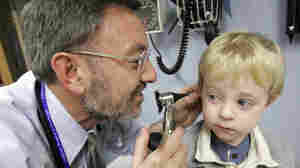 And if the child doesn't have severe symptoms, see if the ear gets better on its own. October 22, 2012  It's important for kids to eat a variety of fruits and vegetables, America's pediatricians say, but there are fewer pesticides and a potentially lower risk of exposure to drug-resistant bacteria in organic produce, if you can afford it.